Nokia may rule a large portion of the worldwide cellphone market, but you know, with the economy and everything, it never hurts to diversify. 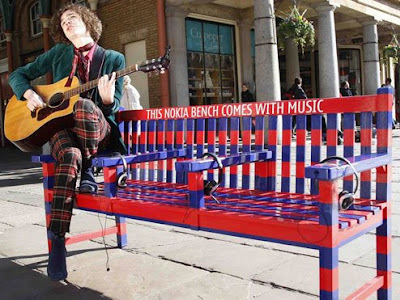 Nokia is setting up musical benches throughout the UK to promote their Comes With Music audio service, each featuring three integrated handsets with headphones to sample music.The track lists are said to mirror the region where each individual bench was deployed, with the Beatles dominating Liverpool but Black Sabbath representing Birmingham. But while you's expect the benches to be stolen/destroyed/soiled immediately, each will feature the close supervision of a security guard, along with the presence of one "performer" (which kind of defeats the purpose of the headphones, no? ).